The De Beauvoir Flower and Produce Show (and Dog Show) has been taking place every year since 1979 (at least). This year, for the first time, WE are jointly organising the show with De Beauvoir Gardeners and this means that we need some help and volunteers. We are not only running the cake stall (domestic delights) but helping with all aspects of the show which is a really lovely annual event – a village style show in the heart of London. It celebrates this corner of Hackney’s growing, creative and dog owning communities and is promoted through local schools to encourage children to bake, draw, grow and make – we even have cup cake decorating on the day. Volunteers to help for a couple of hours on a stall. Volunteers to help with setting up or clearing up. This includes husbands and burley teenagers to help with the heavy work of setting up gazebos, carrying books and tables – either in the morning or at the end (or both). As many individual entries in all categories as possible (we are not doing WI group entries this year) again encourage neighbours, relatives and children to enter too. CLICK HERE to see all the categories so you can start planning your entries now. Contributions of nice items for the tombola (bring items to the August and September meetings). Whole cakes and savouries to sell on the day. Bring your dog along and consider entering the floral fancy dress category. Promote the show on facebook or twitter using the links on this page. We will have sign-up sheets and be available for questions at the August social where we will also distribute posters and leaflets for those who have already signed up for leaflet distribution. If you didn’t make it to last Thursdays meeting you missed out on the delicious smells of lavender, frankincense, nutmeg, and immortelle. 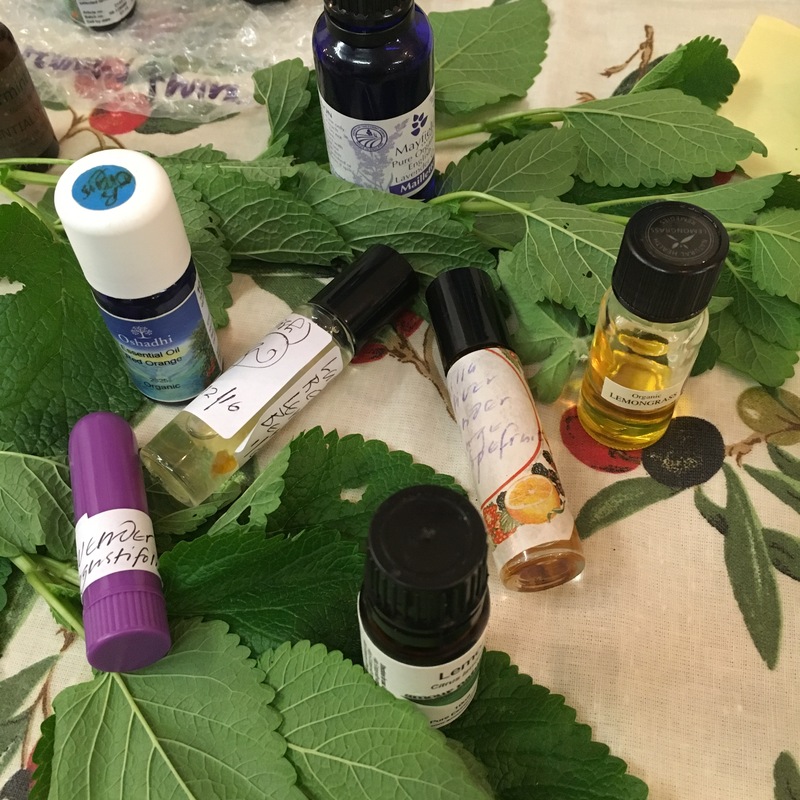 Jane Williams gave us an expansive talk about aromatherapy which started with the history of the art of using scent extracted from plants and spices and ended with members giving themselves a personally scented hand massage. We smelled fresh leaves gathered from Jane’s garden, compared varieties of lavender oils (always keep lavender oil handy for kitchen burns) and discovered how to use essential oils safely. We also learned about how Jane helps cancer patients at University College Hospital where aromatherapy is something that helps relaxation and relieves some of the cruel side effects of cancer treatment. For those of you who want to buy some oils Jane recommends Neal’s Yard and her own favourite Oshadi. Essential oils are extracted from plants and spices. Thursday also saw the circulation of a host of sign-up sheets for the summers big fund-raising events. The first is this coming Saturday when we are running a cake stall at A Royal Knees-up party in Rosemary Gardens to celebrate the Queen‘s birthday. There will be an afternoon of fun for families including a dog show. We are still looking for cakes so email if you can bake, the WI will refund costs. The knees-up is followed by another cake stall at Party in the Park on 9th July – again we are looking for bakers and helpers on the stall. Lastly (but this is the big one) – we have agreed to co-produce the Flower and Produce show in September alongside the de Beauvoir Gardeners. The show will be a great opportunity to raise our profile in the area as well as fundraise. We are looking for volunteers from members and their families to help make this community day better than ever. Local de Beauvoir resident and beekeeper Richard Turnbull was our speaker for October’s meeting. With an easy charm he delighted us with a description of how a beehive works and how he keeps his own hives on a flat roof in his garden. We sat spellbound as we learned about the Queen, her male drones and the thousands of female worker bees that make up a colony. It ended with tasting Richard’s delicious Honey and a slice of Sara’s stunning honey cake! If you want to know what to plant to help support bees there’s a good list HERE. A small group of us went to see this fascinating exhibition at the Truman Brewery which charts the history of Angels costumiers. Costumes from famous shows, films and tv are interwoven with the history of the Angel family (can you imagine having such a lovely name?). 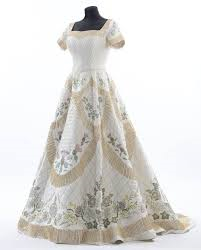 Costumes from Star Wars, Downton Abbey and Doctor Who are on display as well as a replica of the coronation gown itself (shown here). The detailing is quite astounding particularly on the more intricate outfits as was the amount of time and expertise that went into making of these costumes. There was a short notice trip to see Suffragette on Wednesday 14th. It really is a wonderful reminder of the sacrifice that hundreds of women made in order to earn equal status and the right to vote. In the final credits there is a list of dates when various nations extended the vote to all women – from New Zealand who was the first in 1893, to our own in 1928 and then on through a surprisingly late list of entries that included France 1945, Switzerland 1971 and trailing way behind, Saudi Arabia in 2015. If you want to keep up-to-date with activities you can find details of our subgroups, outings, campaigns and activities on the website, including details of a christmas Rosemary Branch trip, the Book Group, Jewellery Making and Knit and Natter group. We are looking forward to seeing you all at the next meeting – we have Hackney MP Meg Hillier talking to us on Guy Fawkes night! A BIG THANK YOU to all the members who donated items for our Domestic Delights stall at the De Beauvoir Gardener’s Flower and Produce show. We were lucky with the weather and sold out of cakes and deliciousness with only a few small jars left at the end of he afternoon. It was a great fundraising activity for us and will help us pay for speakers in 2016. Not only did we have our won lovely stall to promote the DBWI but we featured heavily in the flower and produce show – and the dog show too! If you didn’t get along to see it here are a few pics and you can see all the winners HERE. Party in the Park and the Charleston! At last I have loaded up some pics of Party in the Park – and our wonderful stall. If you don’t already know we managed, for the first time ever, not to sell out of cake! It was a wonderful, sunny and fun packed day and a big thank you to everyone who baked, bought, volunteered and organised. De Beauvoir WI members are invited to the Shoreditch Sisters summer party on 25th August – when they will be having a Charleston workshop! Its free to attend if you are a member – and we are hoping to put a little group together to go from DBWI, we already have five on the list. Just let us know asap if you want to go too and we will pop your name on an email.